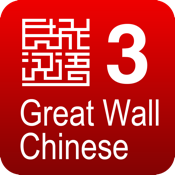 Great Wall Chinese is a new interactive Chinese language learning mode based on multi-media technology. It integrates e-learning with e-tutoring (online or face-to-face tutoring), and provides students an easy, fun and fast way to study the language. Not only is Great Wall Chinese a multi-media teaching and learning tool, it is managed by the learning management system. A Student could follow up his/her study performance and receive progress reports on each unit he/she has studied. Great Wall Chinese consists of three stages. Stage 1, Essentials in Communication, is targeted for people who know little Chinese and would like to learn the language systematically. Stage 2 and Stage 3 are suitable for people who need expansion and open communication in Chinese. As a key project of the Office of Chinese Language Council International (also known as Hanban), Great Wall Chinese is a result of a 9-year research by over one hundred professionals, specialists and teachers in Chinese language teaching and research.